If you're looking to spend as little as possible, but fear doing so will only buy you a bucket of bolts, think again. 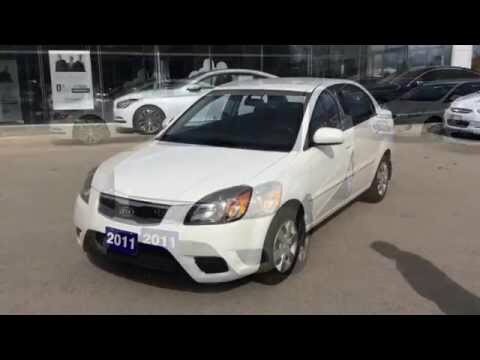 The 2011 Kia Rio is efficient, affordable and reliable. Plus, it's backed by Kia's 10-year/100,000 mile powertrain and 5-year/60,000 bumper-to-bumper warranties. Don't buy a Kia. This Kia and the dealership where it was purchased have caused me so much aggravation that I will NEVER purchase Kia again. My Kia Rio5 has NEVER gotten the gas mileage it was advertised as getting. In the first year, 3 of 4 cylinder sensors went out on it, one of them went out twice. Then the bluetooth switched itself to French and I couldn't get it to switch back to English. After 2-3 years, it switched to Spanish for a short period of time before finally reverting back to English. I 've had many problems with this car that I've never had happen in any other vehicle, such as the ignition continuing to beep after removing the key - just tap the key hole and it stops. Standard cars are fun to drive. My car is a standard transmission. I think those are the best cars to drive. If I can help it I would only buy a standard transmission car because they are better on gas and better to drive in the snow and wet roads. I do think my car is a bit small for my needs though. I cannot fit my scooter in it that I use to get around so I have to use my walker or cane instead. :(. This is my transportation for me and my fiancé to get to work and back home. It is a great car. It runs very well, has great gas mileage and it is a very comfortable ride. The car has a little weird sound when starting but it starts. It drives smoothly and makes car rides a lot better. It has a hook up for USB and aux cord. It is small but gets you where you need and only needs about $25 worth of gas to get a full tank.